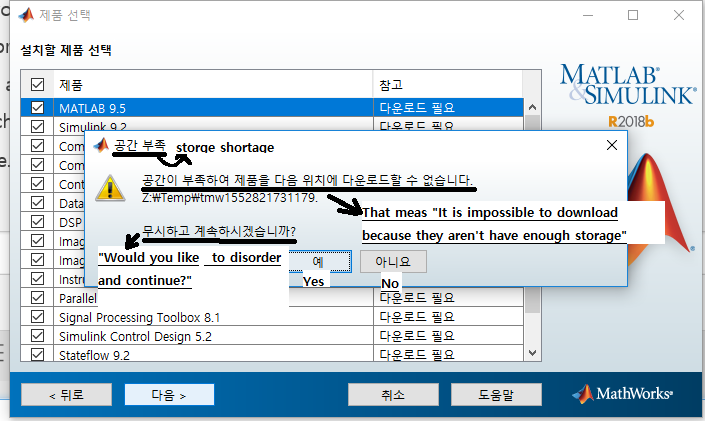 I'm south Korean university student, and I have a problem..
but either has same problem shown Z:Drive's storage shortage. and I had press "Yes" button and it can't installed. You need to download the file before installing them. The installer tries to download them to C:\Users\YourAccount\Downloads. But if your C drive is full, the operation cannot complete. The solution is either to move the downloads folder in the operating system, or to free space on the disk. Run a disk cleanup, see https://support.microsoft.com/en-ph/help/4026616/windows-10-disk-cleanup (link). This is not a problem of Matlab, but of the amount of data on your disk. But... I already have available memory to use 96.2GB in C:drive. (96.2GB / 231GB). And if I installed in C:Drive, program said that there is not enough memory in Z:Drive. sorry for late to answering your feedback. Try to disable the RamDisk on the Z-drive. Finally, I succeed to install your answering(Ramdisk not for use). And I'm really gratitude your help.